Shopping for sleepwear can sometimes be harder than people initially think. It’s important to look for pajamas that feel cozy as can be. It’s also crucial to prioritize top-quality materials and designs. Who wants to settle for pajamas that don’t accommodate their style requirements? If you’re someone who is shopping for women’s pajama pants that epitomize relaxation and lounging around at home, then you can’t go wrong with the sleep pants we offer here at Shadowline Lingerie. These pajama bottoms are the ideal combination of cozy and fashionable. If you want to look and feel like a million dollars as you get your beauty rest, then nothing can top our women’s pajama bottoms. Our women’s pajama pants can be great for anyone who wants to sit back and relax. They’re excellent for women who want to be able to curl up in bed at night with engaging books and magazines as well. They’re elastic waist pants that feature drawstrings. Putting our pajama bottoms on is a breeze. We offer pajama pants that are suitable for all physiques. We can delight you with all of our size options. If you’re on the lookout for the best plus size pajama pants out there, you can give us your full trust. Our plus size pajama pants are flattering, cozy and chic all at the same time. They’re optimal for people who want the best and only the best. We offer shoppers small, medium, large, 1X, 2X and 3X sizes for maximum convenience. 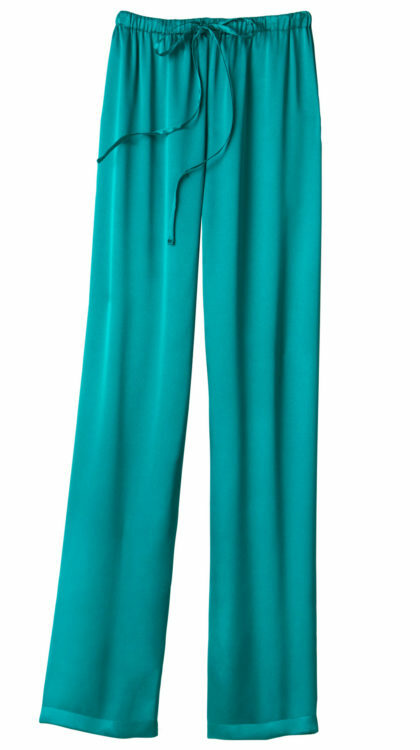 Our sleep pants are accessible in a wonderful array of attractive and contemporary colors, too. These colors are sure to please all style preferences. 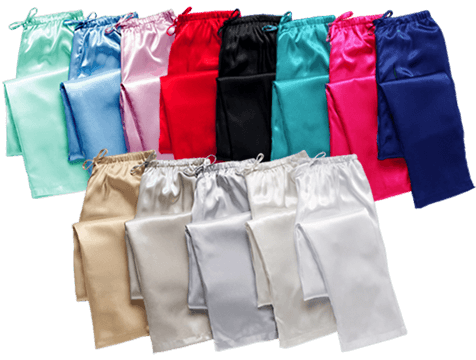 Here at Shadowline Lingerie, we carry women’s pajama bottoms in striking colors such as pink, red, fuchsia, blue, white, green, black and more! You can shine like a superstar in our lovely silk pajama bottoms no matter what your specific aims are for the night. These pants are 41 inches long and are equipped with fits that are terrific for sitting, reclining and walking around the house. Charmeuse fabric is a pleasant satin weave that has an enviably smooth texture. These pajama pants are made entirely out of polyester satin charmeuse. Looking after our Shadowline Lingerie women’s pajama pants isn’t difficult at all. If you want to keep yours in superb shape for as long as possible, you can put them in your washing machine on the “warm” setting. Put your pants in alongside clothing pieces and sheets that are similar in coloration. Keep bleach away from your pajama pants at all times. If you want to rest in the comfiest pajama pants that epitomize coziness, style, and serenity, nothing on the planet can be better than our offerings. Our women’s pajama bottoms can satisfy all kinds of style objectives. Contact Shadowline Lingerie as soon as you can for additional pajama bottom details.